Auto-everything film shooting isn’t normally my bag. I’m more a match-needle, twist-to-focus kind of guy. But even I have to admit, sometimes there’s charm in letting a camera do the grunt work. 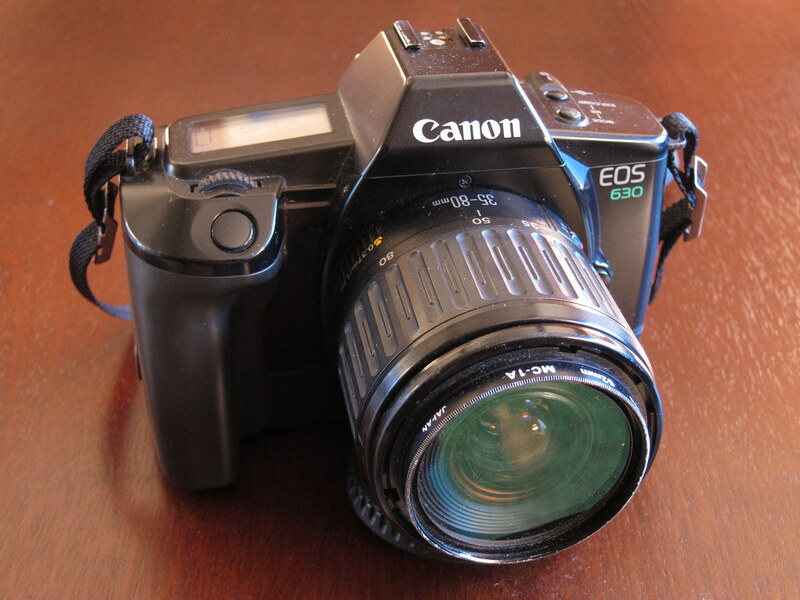 This is a very early EOS camera, dating to about 1989. I’ve only shot this camera once before, that time with the pictured 35-80mm lens. 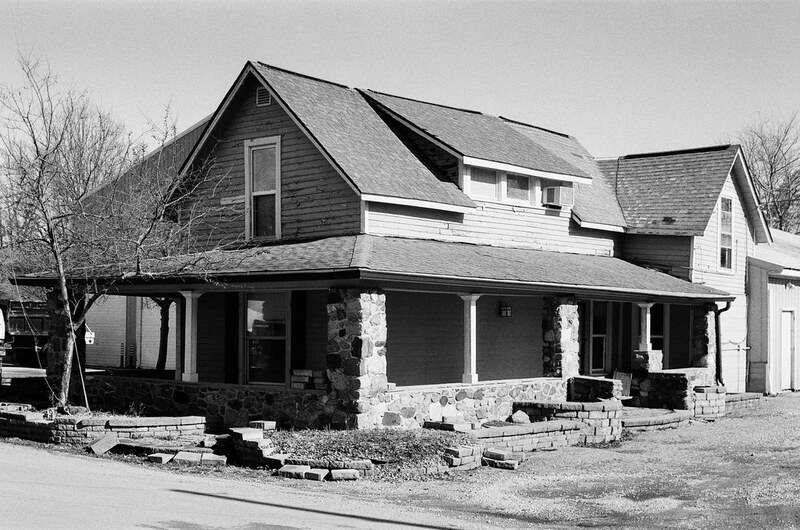 I shot my former favorite (now discontinued) b/w film, Arista Premium 400. 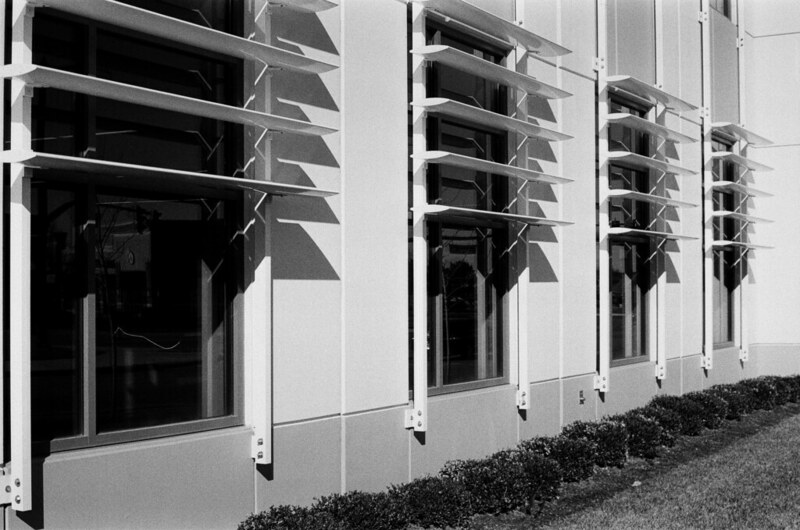 I reached for black-and-white film this time, too: Eastman Double-X 5222. But I used my sweet little 50mm f/1.8 Canon EF II lens. 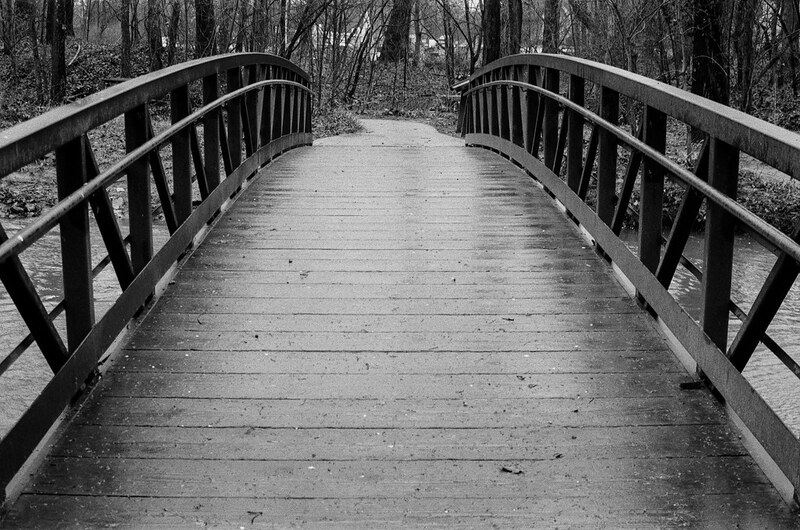 It was gray and cold most of the time I had film in the EOS 630. I’ve never shot Double-X in those conditions and I was surprised by how muddy everything turned out. 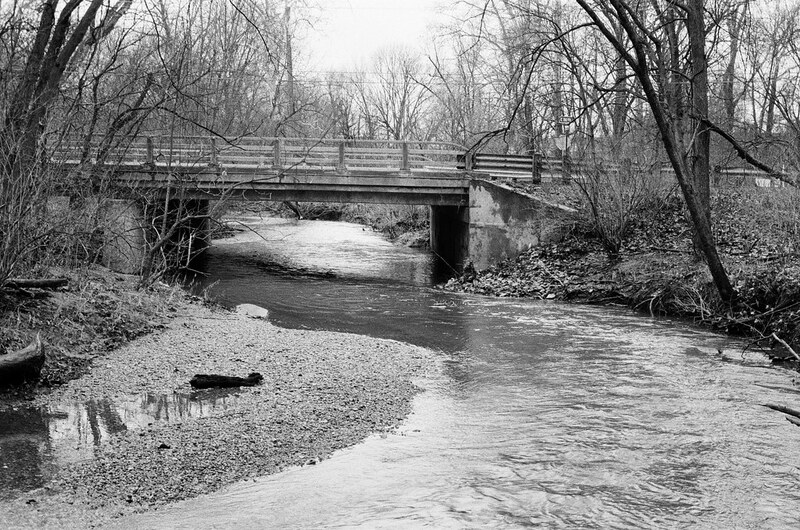 These photos are from Flowing Well Park on 116th St. in Carmel. That bridge there carries 116th. 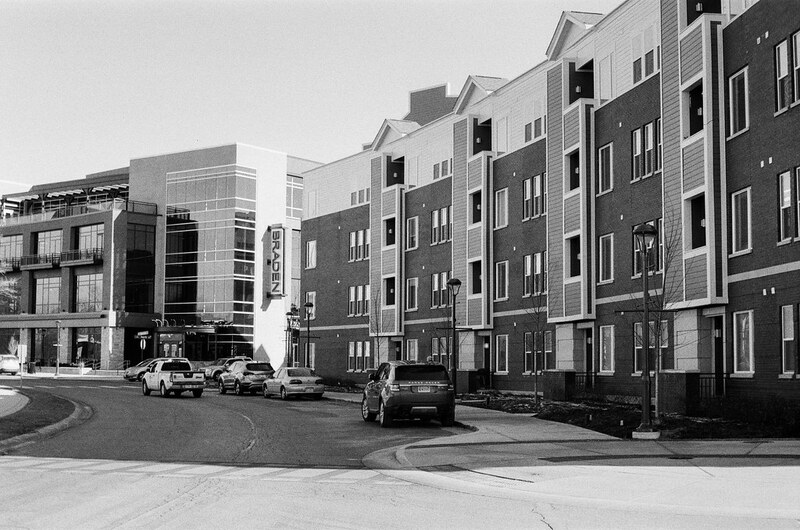 I got a little sun one afternoon and in a spare 30 minutes I took the EOS 630 out on a walk around downtown Fishers. I’ve photographed this area so much over the last year that if you were to look through the photos you’d watch the area change rapidly. It’s heavily under construction. New buildings go up all the time. Which means parking is becoming a problem. 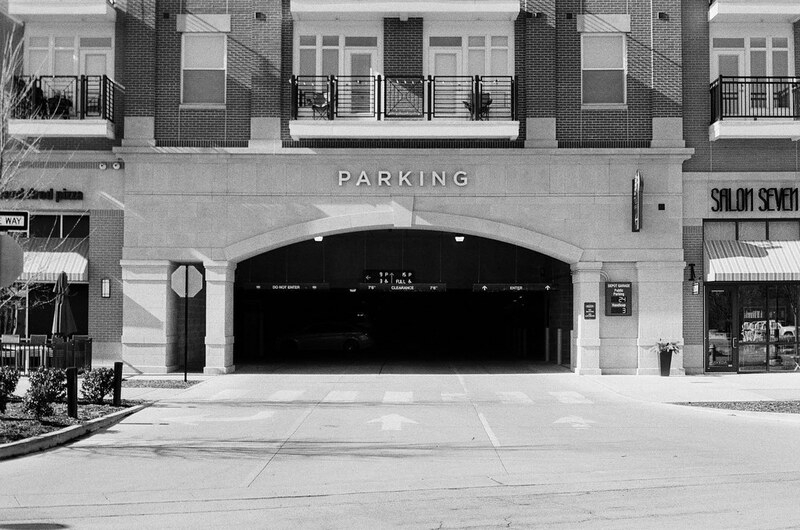 Fishers is solving it with parking garages. I’m not a fan. The EOS 630 kept metering for the shadows, I guess, because the highlights were nearly washed out. Tweaking exposure and contrast in Photoshop helped a little. And lest you think that it’s only new buildings in Fishers, a few of the old houses do remain, tucked into alleyways and along side streets. One old house was converted into a little tea room. 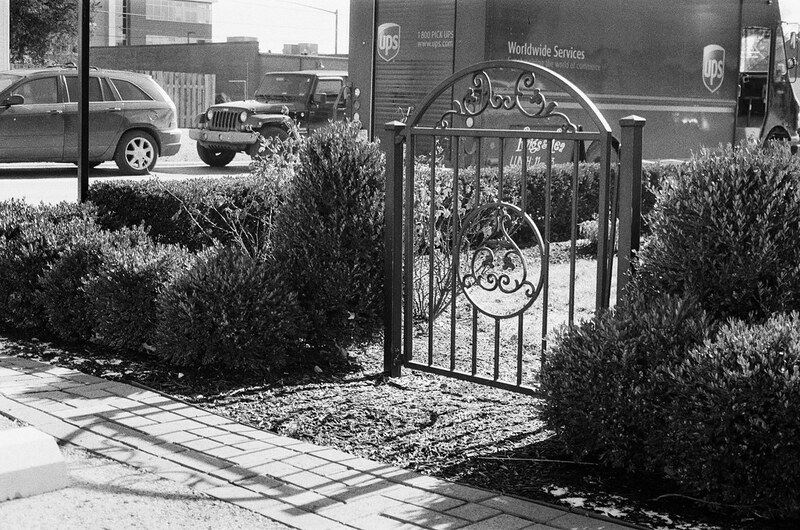 This is its gate. To see more photos from this camera, check out my Canon EOS 630 gallery. I wasn’t enamored of the EOS 630 the first time I shot it. But I’ve used several more auto-everything SLRs since then, enough to know that this really is a pretty good tool. Focus was always right and exposure was at least good enough. I wished that the body were a little smaller and lighter, like the later EOS Rebel cameras. If I have to shoot a camera this bulky, I might as well reach for my semi-pro EOS A2e. It’s a much better camera. And for that reason, this EOS 630 must go. There’s room for at most one EOS SLR in my collection. I’m selling some very nice cameras from my collection. See them here. Jim, I’ve recommended an EOS body more than once on my blog, they are compact, light, meter reliably and are very easy to adapt. I’ve never used a Canon lens on one, only M42 and Contax/Yashica with cheap adapters, with great results. So I completely see the appeal of them. That said, EOS bodies are so cheap and ubiquitous, if you’re going to get one, you might as well get one of the best, like A2e you have, or the 300v I had and enjoyed. Which makes these lower end bodies almost entirely redundant these days. Still, if it was the only SLR you had and/or you’re on a super tight budget (I bought a very pleasant 500N for 99p plus postage! ), the Canon lenses you have plus an adapter or two (M42!) would still mean you’d have a very capable camera compatible with a wide range of glass. I was interested in experiencing the early EOS bodies, which are surprisingly large. They go for cheap, so I picked this one up. I also got an EOS 650, the original EOS camera, at about the same time. I am not in love with EOS cameras. I think it’s the Canon glass I’ve owned — it renders so clinically correct. I wish for the personality my Pentax glass delivers. I am likely to keep my A2e just so I have a good body for the day I come upon more Canon glass to try. I do have an M42 adapter for EOS but haven’t had luck making it work yet. I guess the EOS bodies were immediately preceded by the T series. I had a T70 and it wasn’t huge but pretty hefty and weighty, despite being mostly plastic. The EOS 500N wasn’t massively smaller but it was vastly lighter. The EOS 300V much smaller and lighter still. But the 300V was from 2002, the 500N was six years older, 1996, and this was nine years on from the original EOS in 1987, so there was already a lot of evolution in EOS film bodies before they started going digital. Not all EOS bodies were created equal! What’s not working with the M42 adapter? Just surprised as the one I had was a very basic one that came free with an M42 lens I bought from Germany. It purely provided the mount conversion, there was no electronics, so I focused manually and by eye, but I seem to recall the focus confirm light in the VF still worked. Didn’t think there was much that could not work with these adapters? In the end though, if you have M42 lenses and want to shoot with an M42 camera, you can’t wrong with a Spotmatic. If you want aperture priority, adapt a Pentax M or A series body. Like you I prefer Pentax lenses, so any EOS ultimately became superfluous for me. I had a T70 too. Gave it to a niece last Christmas. Not bad, and took all my old Canon lenses. Lots to like. I don’t know that I’ve given my M42 adapter enough effort yet. It wasn’t effortless to figure it out and time was short (was busy moving) so I set it aside. Don’t remember now what the problem was. If you really like using the A2e, persevere with the M42 adapter. If you don’t, don’t bother! The T70 is so 80s. I actually quite liked it and it was a change from using older manual cameras which are much of a muchness between brands. But I’ve just never really warmed to Canon as a brand, and the lenses I’ve had have been good enough but nothing special, not like a Takumar or Pentax-M or -A. “The Canon EOS A2 is an all-time great sleeper camera and one of the best-kept secrets in photography. When first introduced, it was nearly ten years ahead of its competition, and although now getting a little long in the tooth, it was, and is still, used by an astonishing number of working photographers. The A2’s combination of just the right features, precision, silence, durability, and reliability make it one of the best cameras ever made for day-in, day-out professional work. My pair have been in use for eight years and have been utterly reliable. And they’re light, like my Olympus OMs were. Several years ago one of my A2 bodies and 80-200L zoom fell three or four feet from the seat of my 4-wheel-drive Ford F-250 pickup to a hard road surface. There’s a crack about 1/2-inch long in the baseplate of the A2 and the metal lenshood was dented slightly. Everything works fine. The polycarbonate plastics are lighter, yet tougher than metal. My A2s have been responsible for an award-winning coffee-table book (“Rock City Barns: A Passing Era” — you can look it up at amazon.com if you’re interested), numerous brochures, magazine articles, weddings, and all the other things in the work flow of a small-market commercial/editorial photographer. I recently finished a 20-page promotional booklet for a client, working mostly with an A2 with an 85mm f1.8 lens and a Leica M3 with a 50mm Summicron. 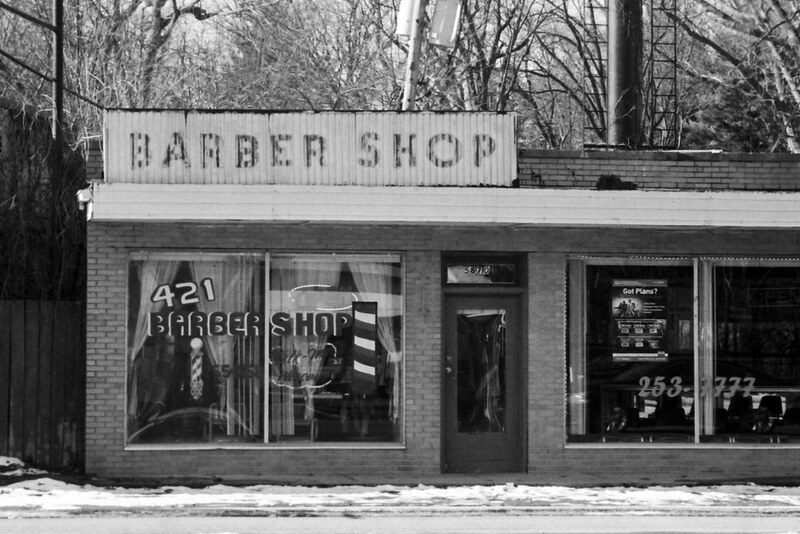 It was all available light work, and the film was Ilford HP-5+ rated at 800 and developed in T-Max. I think I could safely defy anyone to look at the 8x10s and tell me which lens made which photos. At this point, I can’t even do it myself without checking the contact sheets. And did I mention that the A2 is quiet? It is nearly as silent as the Leica. I liked the A2e I bought a couple years ago. Easily my favorite Canon body. I wouldn’t mind playing with some Canon lenses other than my 50/1.8. I like the 50 pretty well (though it does tend toward clinical accuracy) but I hear great things about other Canon EF primes. It’s exciting to hear about all the work you did with your A2! I’ll check out your book. Great photos Jim I like the EOS range and have most of the camera’s mentioned above but if you want the ultimate EOS experience you want to try the EOS 1 if you can get one at the right price. Especially the entry-level EOS cameras go for pennies on the original dollar these days. They’re fine cameras for first-time film SLR shooters. I really like my A2e but I’d love to try a 1! Not my cup of tea, but it seems like very good value for the small price they often bring on ebay. The one auto-everything camera I have found useful is the Olympus Infinity Stylus. It doesn’t offer lens interchangeability like the EOS, but the compact portability and the excellent Olympus glass make the mju hard to beat. 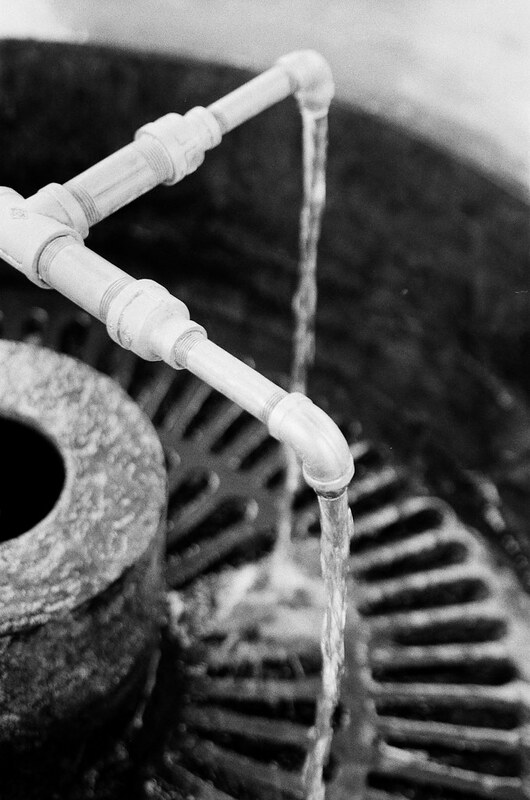 When someone expresses interest in film photography I usually tell them to pick up an old EOS SLR and a cheap zoom lens. It’s a great way to experience film without having to know very much. If they like it, then they can explore the camera more. It does offer reasonable control over settings. If that appeals to them, then they can move on to manual cameras. I enjoy my Stylus as well and it’s a camera that is very likely going to stay in the herd. Never been all that attracted to this type of camera, but you’ve coaxed some nice results out of yours. It’s not hard to get nice results from these. They’re pretty foolproof. Which doesn’t generally spark much joy. What a coincidence, that camera is sat on my table now with a film in it ready for testing. So far I have found the same, it does almost everything for you. Hilarious! It’s a decent camera, really. If I had to, I could shoot it exclusively forever and make fine photographs. I haven’t used a full film yet, but I am sure it is working.